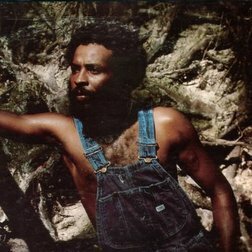 Miami in the 60's, 70's and 80's was an incredible melting pot of sounds. You had the hard edge funk of the Alston and T.K. labels, a steady flow of salsa infusion, and reggae and island influences continually crashing ashore everyday. Those are only a few of the elements that made up Florida's pedigree. In many respects it was a musical hub of the world and now those of us in love with the signature sounds of the area are still unearthing goodies left and right. It is indeed and incredibly ripe area still bearing fruit quite regularly. 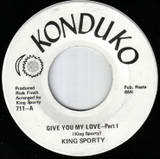 King Sporty was a only somewhat known artist throughout the world, but in Miami and quite possibly in wider Florida, King Sporty was alive on the local airwaves. Whether it was his reggae vibes or his spooky disco sound, it was all soaked in a heavy swamp recipe. He bounced a bit between the two sounds making albums of both styles. King, real name Noel Williams is getting some recent recognitions and discoveries in both categories. I came across his recordings on the Konduko label in my original quest for another Konduko prize the Ronnie Keating 'Going Down For The Last Time' 45. Its of the same caliber and closely associated with other T.K. subsidiaries and quite frankly this tune is a lot like an early K.C. and the Sunshine band sound. It also has that same Clarence Reid and Willie Clarke production feel although they are not noted on the credits. Its just that same old Miami magic shining through. Also, while we're on the same subject, you may want to check out the movie about Clarence Reid. It's "The Weird World Of Blowfly"...While its enjoyable, its also quite depressing and somewhat upsetting. You'll see why, I'll keep my opinion and any spoilers out of the mix.